You'll be £20.00 closer to your next £10.00 credit when you purchase Ship Dioramas. What's this? Order within the next 8 hours, 46 minutes to get your order processed the next working day! This book is about the art of displaying waterline models. By their very nature, ship models that do not show the full hull and are not mounted on an artificial stand cry out for a realistic setting. At its most basic this can be just a representation of the sea itself, but to give the model a context – even to tell some sort of story – is far more challenging. This is the province of the diorama, which at its most effective is a depiction of a scene or an event in which the ship model takes centre stage. As with a painting, the composition is a vital element and this book devotes much of its space to what works and what does not, and illustrates with photographic examples why the best maritime dioramas have visual power and how to achieve that impact. Individual chapters explore themes like having small craft in attendance on the main subject, multiple-model scenarios, dockyards and naval bases, and the difficulties of replicating naval combat realistically. It also looks at both extremes of modelmaking ambition: the small single-ship exposition and the largest, most ambitions projects of the kind meant for museum display. The book concludes with some of the most advanced concepts – how to create drama and the illusion of movement, and how to manipulate perspective. Illustrated throughout with colour photos, the more abstract discussion is backed with practical 'how to' sections, so anyone who builds waterline ship model will benefit from reading this book. As featured in 'Glasgow Now'. Overall I consider it a useful and very interesting book as a work of support or consultation in building naval models either individually or in dioramas. Another really good book from Seaforth Publishing & David Griffith - plenty to make you look and think 'I fancy having a go at that' or even 'so that's how they do it'. Anyone who builds waterline ship models will benefit from reading this book. Whether one is an old-hat at ships but has yet to break away from the full-hull format, or a maritime novice, this book offers plenty for both camps. A Glasgow model ship enthusiast has brought nautical scenes to life in his latest book. 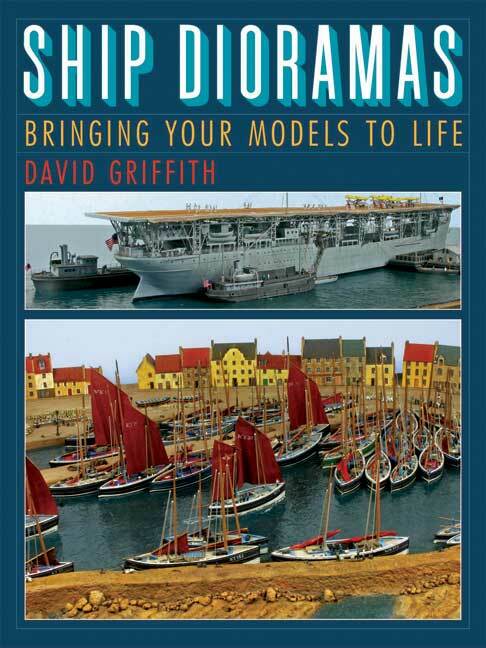 David Griffith's 'Ship Dioramas', his second book, collects some of his dioramas - detailed scenes featuring his ships. One...features the fishing village of Pittenweem in Fife, a scene depicted by David featuring almost 50 boats, 25 buildings and 500 tiny figures, all produced to 1/700 scale.